The Catbird Seat: What does One Trillion Dollars look like? 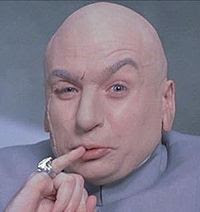 This Guy, Doctor Evil, made the Austin Powers franchise work. While Austin was a bit of an anachronistic buffoon with bad teeth and a thing for Carnaby Street, the Doctor was a man of purpose who knew exactly what he wanted. (OK, altogether now...) ONE MILLLLLLLLLIONN DOLLARS! We chortle, and think that one million dollars could pay off our homes, and start a decent nest egg here in Suburbia Majora, in spite of the good Doctor's fetish for a one with six zeroes. We rub our temples and try not to allow our heads to explode when we try and wrap our brains around the twelve trillion that the current resident of 1600 Pennsylvania has proposed. For this mental exercise, we'll use the humble $100 Bil as our unit of currency. Nothing to sneeze at but wait, there's more! To reach the magic Trillion mark, we'll need to make that 3 foot cube of $100 Dollar bills on 10,000 Pallets. The result is a rectangle 150x300 feet (considerably larger than a U.S. gridiron football field), and is seven feet tall. The entire 12 Trillion will make this pile close to ONE HUNDRED FEET TALL! The MSM will say the tax protesters of April 15th were a bunch of benighted hayseeds who while bitterly clinging to their God and their shootin' irons, are too simple minded to understand the finer points of governance. Ms. Janeane Garofalo will tell you that they're just a bunch a racist spoil sports who can't countenance a black man in the White House. I've got to give credit for lifting all those pallets to the Elves over at Page Tudor.com. You can click this link to see the math behind the madness.